High-quality Career Technical Education (CTE) blends academic and technical skills to provide learners with the real-world skills necessary to succeed in today’s workforce. The integration of Advanced Placement (AP) courses into CTE programs of study promotes career-readiness by encouraging the development of these critical academic and technical skills. 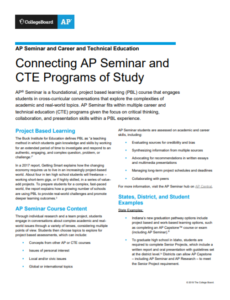 Advance CTE has previously partnered with the College Board to explore embedding AP courses into CTE programs of study. AP Seminar course is a foundational, project-based learning course that engages students in cross-curricular conversations that explore the complexities of academic and real-world topics. The AP Seminar course is able to fit within multiple CTE programs of study given the focus on critical thinking, collaboration and presentation skills within a projected-based learning experience. To help state leaders integrate AP Seminar into CTE programs of study, the College Board recently released a guide, Connecting AP Seminar and CTE Programs of Study, that describes AP Seminar’s course contents and provides state, district and student examples of how AP Seminar could be potentially embedded into a CTE program of study. For example, Indiana’s new graduation pathway options include project-based and work-based learning options, such as completing an AP Capstone course or exam (including AP Seminar).